WELCOME BACK. 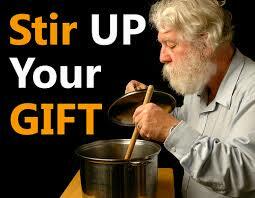 Today I want to emphasize on the need for you to stir up your gift for utmost fulfillment and achievement. The scripture says… stir up the gift of God, which is in you by the putting on of my hands. When you stir up and begin to put your gifts to use, you’ll set yourself on a supernatural course to fulfill your destiny in life. God created you with a specific plan for your life. When you discover, pursue and actualize this divine gifts, you automatically position yourself on the path of success. The responsibility to position yourself on this path rests on you. God will not do it for you. Most people spend their lives out of God’s purpose because they refuse to utilize the gifts God has blessed them with. Your gift will lie dormant until you stir them up. Study the principles of success and apply them to your life if you want to excel in your life. You need to invest time and energy to develop your gifts. Success doesn’t come by chance or luck. It’s consciously created by careful well thought out, organized and planned action. Your gift is what elevate you, make a way for you, creates a path for you and opens a door for you to succeed. You have a gift inside of you screaming for expression. To make a head way in life, you must ask yourself “What am I really good at, what will distinguish me and set me apart as special and unique among my friends? What can I do best? Make a list of all the gifts, talents and abilities you possess. Narrow your area of strength down to at least one gift and concentrate all your energy on it. When you develop this gift, you will begin to make extraordinary progress in life. This gift will take you to the top of your ladder of success. using gift is the key to spiritual success…. Yes! thanks so much for your time. See you again for another interesting and soul uplifting spiritual principles… You will succeed! Good article my friend, keep it up and good luck. God bless you. See you my friend, thanks. Welcome to Virtual Vitamins. I am honored by your follow. May my words bless you, as I’m sure yours bless many.